I have to admit, like any person claiming to have common sense, I was skeptical but open minded about the benefit of gemstone healing. In 1988, I had a brief encounter with a gemstone guru and one night she had us over to her house and did a parlor trick. She had us each take a wadded ball of aluminum foil in our palm and try to raise our fist to shoulder level while she applied pressure downward. We could not get our fist to even shoulder level. Then she replaced the foil with an amethyst stone, which had much better results. The lesson was that aluminum was bad and showed visible signs of weakening the body while the amethyst, with its good vibes, was a positive influence. Unfortunately, I didn’t see her much after that and never learned what I wanted to from this lady who made a living at gem therapy, but the evening never left me and years later this interest would change the direction of my life. How does it work? All matter has vibrational frequencies. Our bodies, no matter how different we think they are, are held together in the same patterns and structure down to the molecular level. We all learned in science how electrons are always moving. We are not consciously aware of it all the time but we know it to be true. Even a rock is made of moving electrons. These electrons generate frequencies which vary somewhat depending on the makeup of the rock. Rocks or gemstones have frequencies that align our own frequencies. A gemstone has more stable frequencies than an herb or a person and is perfect for straightening out our misalignments. Misalignments can show up in our bodies as common ailments: depression, illness, joint aches, etc. Gemstones can bring us back to balance, back to what Nature intended us to be before the imbalance. Until you have tried it, you will never truly understand the power at your fingertips. I tell everyone about the power of Indian Agate. I have seen this miracle happen over and over again. Indian Agate heals internal infections like the common cold, bronchitis, and bladder infections. 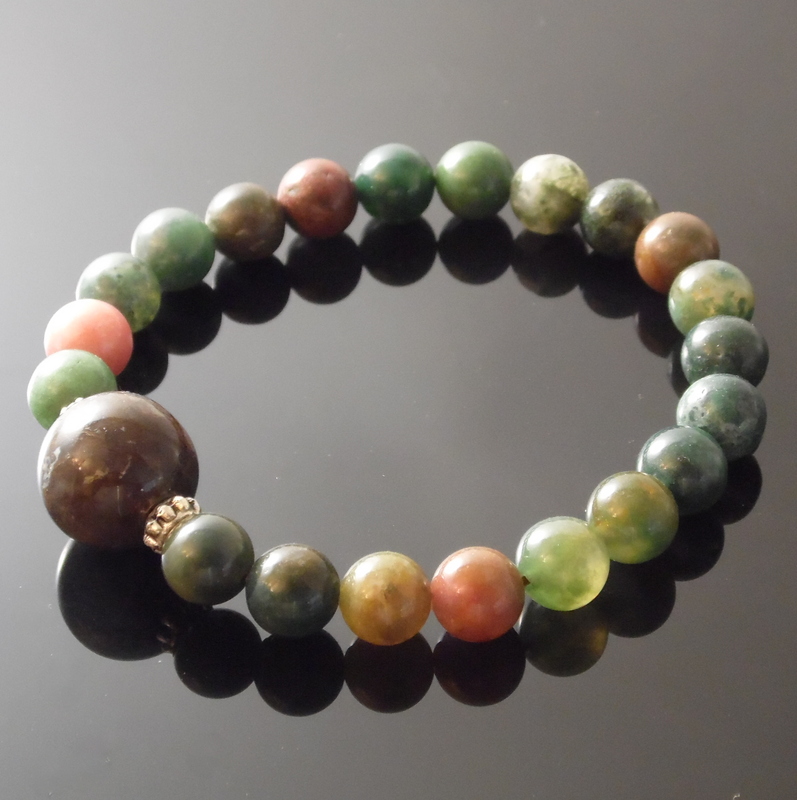 Every time I feel that tickle in the back of my throat signaling an oncoming cold, I slip on the Indian Agate Bracelet. If worn right away, it will knock away all illness. If introduced several days after the cold has started, it will shorten the lifespan of the cold symptoms. My mom was still coughing from her bronchitis 2 days after finishing her Z pack. After discounting the Indian Agate, she finally conceded it wouldn’t hurt to try it and her coughing subsided in a few hours. Two days later she started coughing again, and I knew she had removed the bracelet. I reminded her to put it back on and the coughing was banished again. I wear mine around the public or around sick people to keep me healthy and it really works. For less than a bottle of herbs, you can have a lovely bracelet or necklace that will last forever.